Recognizing the value of specific bird habitats to the State's environment and quality of life, the Maine Legislature determined that these habitats warranted protection under the Natural Resources Protection Act (NRPA) in 1988 as Significant Wildlife Habitats. 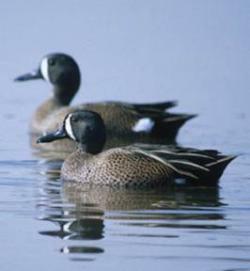 After 10 years of data collection and 2 years of legislative review to complete the development of habitat screening maps and additional rulemaking, the DEP began regulating activities in, on or over valuable waterfowl and wading bird habitat and shorebird feeding and roosting areas on June 8, 2006. Additional modifications to these regulations were effective June 14, 2007. Copies of the rules that define these habitats and establish licensing criteria (Chapter 335, Significant Wildlife Habitat) are available by mail or on the internet at www.maine.gov/dep. What bird habitats are regulated and why are they important? Inland waterfowl and wading bird habitat: Maine Department of Inland Fisheries and Wildlife (DIF&W) has identified significant inland habitats for ducks, geese, herons, and similar species of waterfowl and wading birds throughout the state, rating them as having high to moderate value. A high to moderate value inland bird habitat is a complex of freshwater wetland and open water areas plus a 250-foot wide area surrounding the complex itself where inland species of waterfowl and wading birds nest. On great ponds 1 , only the upland area that is within 250 feet of the freshwater wetland is included as part of this bird habitat. Shorebird feeding and roosting areas: DIF&W has identified essential staging area habitats where concentrations of shorebirds like plovers and sandpipers congregate during migration periods. These staging areas include areas where the birds feed and rest. Shorebirds feed constantly in the intertidal area to build up reserves for their long migration. 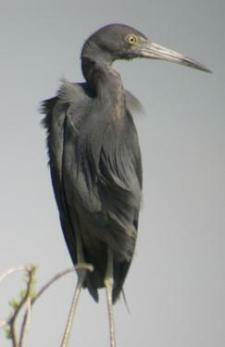 When the tide is high, they rest (or roost) just above the high tide mark. 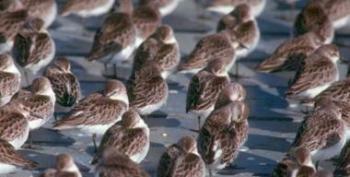 Shorebird roosts are often stony or sandy beaches, sand/gravel bars, rock ledges, or islands with little or no vegetation. Buffers near these feeding and roosting areas are a critical part of the habitat because they protect the birds from disturbance so they can prepare for their long migratory flights. Ashorebird feeding area includes the intertidal area used for feeding and a 100-foot buffer area. This buffer area is measured from the edge of the coastal wetland 2, and includes nearby upland areas. A shorebird roosting area includes the intertidal area used for feeding, the roosting area, and a 250-foot buffer area. This buffer area is measured from the edge of the roosting area, and includes nearby upland areas. Tidal waterfowl and wading bird habitat: The DIF&W has identified and rated certain intertidal areas along the coast as high or moderate value to waterfowl and wading birds. This high to moderate value tidal habitat is limited to the identified tidal habitat area and is located within the coastal wetland 2, which is already regulated as a protected natural resource pursuant to the NRPA. How do I determine if I have one of these Significant Wildlife Habitats on or near my property? Habitat screening maps for each organized municipal jurisdiction within the State are available on the internet at MaineDEP.com under keyword birds . Site-specific assessments are helpful to determine the presence of these habitats on individual parcels of land. If you would like a site visit to verify whether your property contains habitat subject to regulation, you should call the DEP and ask for a field determination. As of June 14, 2007, if new bird habitat areas are identified by DIF&W as one of the protected bird habitats discussed in this Fact Sheet, the DEP will notify each municipality in which the significant wildlife habitat is located as well as members of the Legislature who represent residents of that municipality. What kinds of activities are regulated? Any construction, repair or alteration of any permanent structure. Is the habitat area a no-build zone? The habitat area is NOT a no-build zone. The standards in the NRPA require that all activities avoid and minimize impacts. If it is feasible, regulated activities should occur outside of the habitat area. If it is determined that there is no practicable alternative to the activity outside the habitat area, a permit can be issued for the activity as long as the NRPA standards are met. 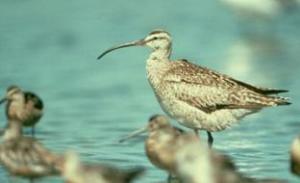 If I only want to cut or remove vegetation in a shorebird habitat, what are the standards? Cutting or removal that meets the same vegetative screening standards that apply under Shoreland Zoning within 75 feet of a coastal wetland 2 (as detailed in DEP's Shoreland Zoning guidelines, Chapter 1000). These standards are applied to the entire 100-foot feeding area buffer. Cutting or removal determined necessary by the DEP in order to conduct other activities approved by DEP that are done in accordance with NRPA standards such as avoidance, minimization, and no unreasonable impact. Shorebird Roosting area. Cutting or removal of vegetation is prohibited except as described below. All cutting or removal must be done in consultation with DIF&W. Removal of a safety hazard. Cutting to allow a meandering footpath no more than 6 feet wide that does not create a cleared line of sight to the water. Cutting or removal determined necessary by DEP in order to conduct other activities approved by DEP that are done in accordance with NRPA standards such as avoidance, minimization, and no unreasonable impact. The DEP may not approve cutting to create a view unless DEP determines that there will be no unreasonable impact on the habitat. What kind of permit do I need for an activity in a Significant Wildlife Habitat? A new permit by rule (PBR) section of DEP rules (Chapter 305, Section 20) became effective on December 5, 2006 for activities in existing developed areas that are located in, on, or over high or moderate value inland waterfowl and wading bird habitat, or in, on or over shorebird feeding and roosting areas. Based upon legislation that became effective June 14, 2007, the DEP is amending the PBR rules to allow for cutting or removal of vegetation in these habitat areas under the June 14, 2007 legislation standards (this rule is scheduled to be completed by the end of 2007). If you don't qualify for a permit by rule, a full individual permit is required. What if I need an individual permit? If your proposed activity requires an individual permit, you will need to demonstrate the need for the activity to be within the habitat area in other words, avoid impacting the habitat areas if possible. If being located within the habitat can't be avoided, you must minimize the amount of development that occurs. The permit applications generally require the submittal of a detailed site plan for the project, which needs to be accurate but does not need to be prepared by a professional, showing all property boundaries, habitat and protected resource areas, existing structures and developed areas, proposed structures and developed areas, and other items specified in Chapter 335; a description of the project with a thorough discussion of all alternatives to the current proposal; and photographs. Other specific requirements are outlined in the permit application materials and Chapter 335. Where do I get copies of the habitat screening maps and other information? A copy of the habitat screening maps for each organized municipal jurisdiction within the state, and other information about these significant wildlife habitats, can be obtained from the Department of Environmental Protection on the internet here. If you require additional assistance please contact your nearest DEP office location. If calling the DEP, please ask to speak with the on-call representative for the Land & Water Bureau, Division of Land Resource Regulation. 1 "Great ponds" means any inland bodies of water which in a natural state have a surface area in excess of 10 acres and any inland bodies of water artificially formed or increased which have a surface area in excess of 30 acres. 2 "Coastal wetlands" means all tidal and subtidal lands; all areas with vegetation present that is tolerant of salt water and occurs primarily in a salt water or estuarine habitat; and any swamp, marsh, bog, beach, flat or other contiguous lowland that is subject to tidal action during the highest tide level for the year in which an activity is proposed as identified in tide tables published by the National Ocean Service. Coastal wetlands may include portions of coastal sand dunes.